Update: AT&T has just confirmed to us via Twitter that this is legit! The message says it will take up to 4 weeks for the free minutes to post to your account. Some iPhone customers received text messages alerting them to the free minutes, but even those who didn’t get the notification apparently are eligible as discovered by 9to5Mac readers. This appears to be a retention effort by AT&T to reward customers and perhaps avert them from jumping ship to the Verizon iPhone. Heads up all: this is NOT iPhone specific, all AT&T customers are eligible. I got the minutes for my iPhone, coworkers got them on their Androids and iPhones, it looks like ALL CUSTOMERS ARE ELIGIBLE! I’m maxed out on rollover minutes so I guess I don’t need to bother with this. Yes, I do live a dull life…. I got the message TWICE in 10 mins, I hope it doesn’t keep coming? It says thank you for accepting… what exactly am I saying yes too? 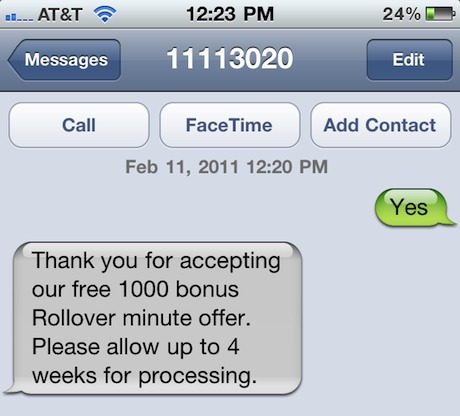 Great, this will go nicely with my other 3000+ rollover minutes that I will never use. Hey, AT&T, want to make everyone really happy? Offer unlimited SMS for all plans for free since it essentially costs you nothing. Nice! thanks for the tip! Certainly could use more minutes. I’m on a 700 min family plan with 2 lines and I got the free mins. Cool stuff. TY ATT!